Straddling-the-border-immigration-policy-and-the-ins is a book I took out from the bookshelf this Labor Day Weekend amidst the burning heat wave in San Francisco, CA. I briefly remember browsing through the pages of this book while Saddam Hussein and Osama Bin Laden were still part of the constant news media syndication's. It was also the time as stated in the book, Microsoft's founder, Bill Gates testified to the US Congress on his distinct need for foreign workers on the annual limits on the H-1B visa workers program. Three weeks ago, major news networks in California reported a Nurse Latina worker living in the US for 2 decades was deported back to her native country living her children on their own. Senator Dianne Feinstein (D) of California as I've mentioned in the previous tried to intercede but her efforts were only good for 24 hours. The remedy would be a special law created for this person which will be almost impossible considering even if approve by Congress would need the signature of the current President. Quoting from the book, " The 1998 Gallup Poll data suggest that a majority of Americans believe that most immigrants are undocumented and of Mexican decent. It is reasonable to assume that this belief is attributable in large part to the portrayals of immigration issues, particularly in the border states of the Southwest. While there are legitimate immigration concerns, exaggerated, misguided, and inflated accounts of immigrant issues by politicians perpetuate pejorative social stereotypes". One of the past campaign slogans I remember was to "bring back the jobs to America" to stop the jobs being outsourced. During that time the news covered on Call Centers booming in third world countries for customer service calls. I for one supported the slogan due to my own experiences trying to call a real person in customer service only to find someone in overseas which I didn't have an issue except that it was too hard to regretfully repeat and explain the nature of my call/issue and nonetheless can barely understand what the person on the other line was trying to communicate to me. Understanding more the INA or the Immigration and National Act of 1996 in the book gives an overview how the change on the Immigration process change then. Yet it also gives an on overview on how this act is so far old and needs revisions and find tuning. It is hard to predict whether the statement on the 1998 Gallup Poll exaggerated by politicians was a precedent to the Trump campaign in the 2016 elections or simply President Trump stereotype Mexicans or if he indeed truly thinks it would be economically beneficial in building the wall between the United States and Mexico. For now, let us remember what the United States was founded on, and as a nation of immigrants contributing to it's economy and it's greatness. God Bless the United States of America. 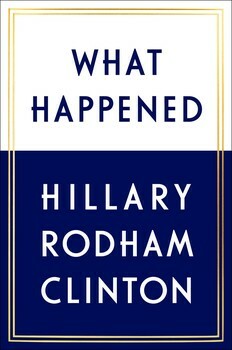 What Happened by Hillary Clinton will soon be hitting the bookstores on Sept. 12, 2017, a day after the US remembers the Sept. 11 attack on the World Trade Center during the Bush era. I started with this as right after the World Trade Center attacks and President George W. Bush launch the Iraq invasion, then Senator Hillary Clinton was one of those that approve the Iraq invasion and war - Years after her work as Secretary of State under the Obama administration was very prominent and colorful defining her political fate as stateswoman in foreign diplomacy. With this came part of the major hurdles in her presidential bid leading to her defeat to incumbent President Donald Trump for the thousands of leak emails using her personal email server for state email communications. Her approval of the Iraq war was one of the repeated propaganda's against her even as democratic party nominee until being the official democratic party presidential candidate in 2016. History will write Hillary as the first woman in the US to be a standard bearer of a major party as presidential candidate. In her new forthcoming book, she describes what it was like to run against Donald Trump, the mistakes she made, how she has coped with a shocking and devastating loss, and how she found the strength to pick herself back up afterward. With humor and candor, she tells readers what it took to get back on her feet—the rituals, relationships, and reading that got her through, and what the experience has taught her about life. She speaks about the challenges of being a strong woman in the public eye, the criticism over her voice, age, and appearance, and the double standard confronting women in politics. Hillary takes you inside the intense personal experience of becoming the first woman nominated for president by a major party in an election marked by rage, sexism, exhilarating highs and infuriating lows, stranger-than-fiction twists, Russian interference, and an opponent who broke all the rules. This is her most personal memoir yet. In the last few months, speculations and speculations, threads and threads of feeds on social media talked about how she lost and why as well as if she is going to make a comeback. In the few years then I was sort of involved with political affairs during my time as as an APEC Youth leader what I've seen so far is that Mrs. Clinton has outlived any presidential candidate in history of presidential candidates as she was able to come back and make another run for the presidency in 2016 after losing in 2008 to then Senator Obama. She was able to make the comeback as she had the popularity, she and her husband has the army of followers and supporters and she did not really had a lot of questionable past scandals and moreover she was an effective Junior Senator form New York which initially people had reservations when she made the run for Senator after being First Lady. The last part is that she has the professional merit as Lawyer and her enduring work then for the healthcare initiatives as First Lady leading to the Affordable Care Act. With that in mind, the reality is presidential candidates normally retire from the lime light and embrace being a private citizen after a defeat. Hence, which is why I mentioned Hillary was unprecedented making a second run for the presidency. Yet, it is done, she will be in another end of being an observer and private citizen but she will indeed have a big section when the history books are written as the first woman as a major party presidential candidate which of course will defined her political life from being First Lady, Senator and then Secretary of State. So we should look forward on her more on being a pro-active political observer and being involved in preserving democracy in America.